Performers include: Tom Selleck, John Hillerman, Roger E. Mosley, Larry Manetti, Gillian Dobb, Kwan Hi Lim, Jeff MacKay, and Kathleen Lloyd. Private investigator Thomas Sullivan Magnum IV (Tom Selleck) is a former U.S. Navy Seal and Vietnam veteran who lives in Hawaii. He lives in the guesthouse of the estate owned by popular-but-never-seen author Robin Masters. 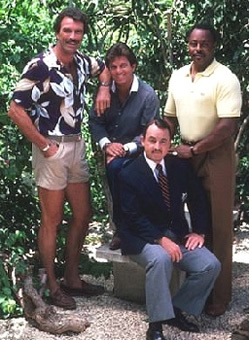 Robin’s estate is run by uptight Jonathan Quayle Higgins III (John Hillerman) who is often at odds with Magnum and, who Magnum suspects is actually his unseen benefactor. Driving Robin’s Ferrari 308 GTS, Magnum lives the life of luxury and takes on cases as the mood strikes him. He’s sometimes aided by his war buddies; helicopter pilot Theodore “T.C.” Calvin (Roger E. Mosley) and club manager Orville Wilbur Richard “Rick” Wright (Larry Manetti). Note: Magnum P.I. was listed as a new Fall 1980 show but didn’t actually debut until December. The writers strike of 1980, which ran from March 7th to August 7th, 1980, significantly delayed production. Best series ever too I love this show even though don’t live it watch ever single one episode. I hate new one like remake MacGyver and Hawaii five-0 shows better returns series.